This candy jar quilt pattern is even more fun when you use fabric printed with Christmas treats to fill the appliqued jars. Applique and quilt the Candy Jar Quilted Table Runner in no time for a fast and festive Christmas table decoration! Making the jars is fun and very easy, and once you've finished your applique quilt patterns, all you need to do is finish the pattern. These make wonderful quilted table runner patterns in any room with their spirited colors and creative use of candy-filled fabric. It'll certainly get guests ready to eat in your home during the holidays. 1 yard front and backing fabric- I used the same for the front and the back. If you use different fabrics, get a 1/2 yard of each. Christmas candy fabric - fat quarters work fine here. Jar lid fabric - you only need a tiny bit of this. Batting or fusible felt - I'm loving fusible felt! I used it for this project. Cut front and backing fabric pieces 18" x 36". 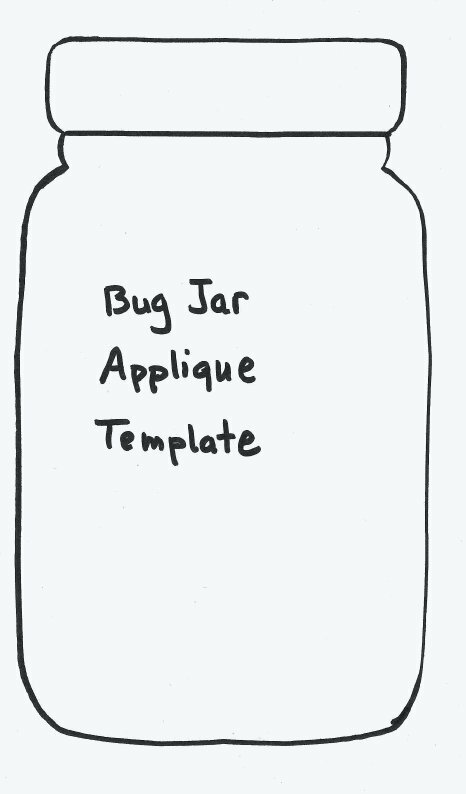 Print out the jar template. Trace four jars and four lids onto the fusible side of Steam a Seam 2. Peel off the backing paper and iron onto the wrong side of your fabric. Cut out jar appliques from candy fabric. Peel off the backing paper and position the appliques on your front fabric. To help in doing this, I drew a line down the middle of the fabric with chalk. Place the first two jars with lids 4-1/2 inches from the top, 4-1/2 inches from the bottom, and 1 inch away from the center line. Place the next jars 2 inches from the first jars. Iron into place. Use a tight zigzag stitch and sew around the raw edges of the jars and the lids. Cut an 18"x36" piece of batting or fusible felt. If you're using the felt, iron it to the front piece; if you're using batting, layer this below the front piece. Put your backing fabric on the bottom and pin to hold everything in place. Quilt. I used my free motion foot and quilted around the jars and around the individual candies in the jars. I then quilted a freestyle Christmas tree and random loops pattern for the background. Trim edges to make them even again and round corners. I do this by folding the fabric in half and cutting two corners at a time. Pin on bias tape and sew into place. Iron and you're done!